Florida head coach Will Muschamp was pleased with how quickly players were able to pick up the new offense during the spring. GAINESVILLE, Fla. — The first phase of Florida’s turnaround project is complete. The Gators closed spring camp Saturday with a 23-23 tie in the annual Orange & Blue Debut. The spring game concluded a busy stretch since the end of last season’s 4-8 campaign. Florida coach Will Muschamp brought in three new assistant coaches, UF signed another top-10 recruiting class, new offensive coordinator Kurt Roper installed an up-tempo spread attack drastically different than what the Gators ran last season, and then the Gators turned their focus toward the future during 15 spring practices. Late Saturday afternoon after the spring game, Muschamp said the next step is for the players to hold each other accountable during summer workouts and to strive to improve before fall camp. "Our older players understand the importance of this time of year," Muschamp said. "Understanding in all three phases: taking the next step schematically, being in shape, being ready to go and understanding what it’s going to take to be successful and win in this league." To ensure the message gets across, assistant coaches are meeting with their position groups all week to discuss goals for the offseason, and Muschamp will meet with every player on the team this week to discuss their spring camp, summer objectives and where they stand heading into fall camp. The offense’s makeover went well this spring as redshirt junior Jeff Driskel separated himself at quarterback and looked sharp after shaking off some early rust in camp. "I thought he did really well," Roper said Saturday. "He’s a guy who understands how to play the game and made plays in the run game and pass game. You can see he’s a highly functioning SEC quarterback." Driskel completed 19 of 33 passes for 171 yards and a touchdown Saturday. Perhaps most important, Driskel looked confident running the no-huddle offense strictly from the shotgun. "Whenever you get a new offensive coordinator you get re-energized," Driskel said. "We feel like it’s a new start, playing no-huddle, there’s something about it where you can get rolling. It’s been a lot of fun and our guys have fun making big plays." Roper coached from the sideline Saturday to speed up communication since it was the Gators’ first live game action since his arrival. Roper has coached from the booth his entire career. Roper operated quickly in getting plays in and worked in concert with offensive graduate assistant Chris Leak and two other staff members using hand signals to make sure the offense was efficient. "We’ll have a bunch of signal guys," Roper said. "Chris Leak understands all of them. We’ll have to add some players in that. They do a good job of translating." The two teams combined to roll up 606 yards of offense and threw the ball 66 times on 111 plays (59.4 percent). The Gators ran the ball 482 times and passed 311 times (39.2 percent) last season under offensive coordinator Brent Pease. The quarterbacks and the new offense took the spotlight during the spring game. "I like to throw the ball. I think you have to be a highly functioning passing team in today’s world," Roper said. "You’ve got to be able to do that whether it’s third-down situations that come up, end-of-game situations where you are behind. I think we’ve got a good start on it." Florida fans got their most extended look at redshirt freshman running back Adam Lane, a 5-foot-7, 222-pounder from Winter Haven, Fla.
Lane rushed for a game-high 64 yards and dislodged safety Keanu Neal’s helmet on one collision. 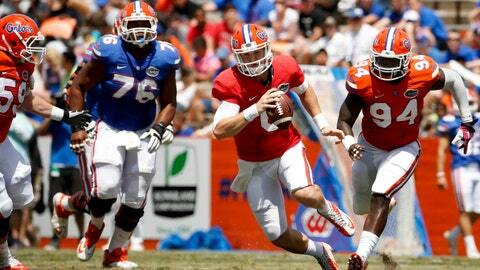 "He’s a guy that not too many people want to tackle," Driskel said. Lane is behind Kelvin Taylor, Mack Brown and Matt Jones on the depth chart, but his powerful build and low-to-the-ground running style provides the running game with a different element. "I just try to always go forward, keep my feet moving and blast the defense," he said. Kicker Austin Hardin had a better day Saturday than he’s had in a long time in front of fans. Hardin missed 8 of 12 field goals last season and lost his job. He was 0-for-5 from beyond 40 yards. However, Hardin was 4-for-4 Saturday including kicks from 43 and 42 yards. "He’s just been more consistent with his plant foot," Muschamp said. "He’s been more consistent with his swing motion of kicking through the ball, and more consistent with his follow-through, falling forward. "The golf swing and the swing of the kicker’s leg are very similar, and a lot of that has to do with confidence and hitting the ball the same way all the time." Offensive lineman Trenton Brown started at right guard and appears slated to play inside. Brown started five games last season at right tackle with Chaz Green out for the season following shoulder surgery. "You’ve got to get your best on the field," Muschamp said. The 6-foot-8, 361-pound Brown showed coaches during camp that he could handle the position and Muschamp praised him for a block on linebacker Jarrad Davis in the spring game. 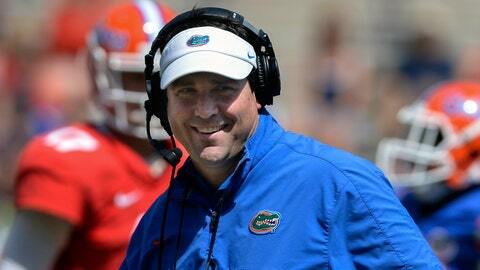 "Really cleaned out the side for us there," Muschamp said. "He’s a big man, moves extremely well and improved every day." Two of UF’s top defensive players — cornerback Vernon Hargreaves III, end Dante Fowler Jr. — did not play Saturday. "We needed the young guys to play a bunch of snaps. We knew that going in," Muschamp said … Sophomore quarterback Skyler Mornhinweg, who started three games last season, showed signs of improvement. Mornhinweg completed 14 of 18 passes for 149 yards and two touchdowns. He competed with true freshman Will Grier this spring in a close battle for the No. 2 quarterback spot. "Both of those guys did some nice things through training camp," Muschamp said. "It’s really important for those guys to continue to improve. The number of at-bats they continue to have in a new offense for Skyler and college football for Will, they’re just going to continue to get better and better." … The announced attendance of 35,834 was the 10th-largest for a UF spring game since 1984 … The Gators had 18 different players catch at least one pass in the spring game, topped by Quinton Dunbar and Fulwood with four catches apiece … Redshirt freshman defensive back Marcell Harris recorded a game-high nine tackles; Harris is in the mix at safety entering fall camp.